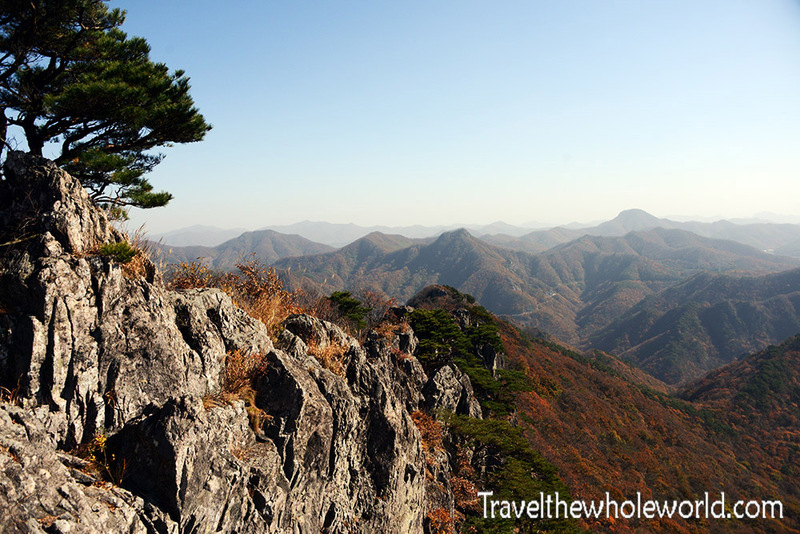 South Korea is a very mountainous country and boasts about 20 national parks. The only one I have visited so far is Naejangsan. It wouldn’t have been my first pick if I had been in Korea any other time of the year. 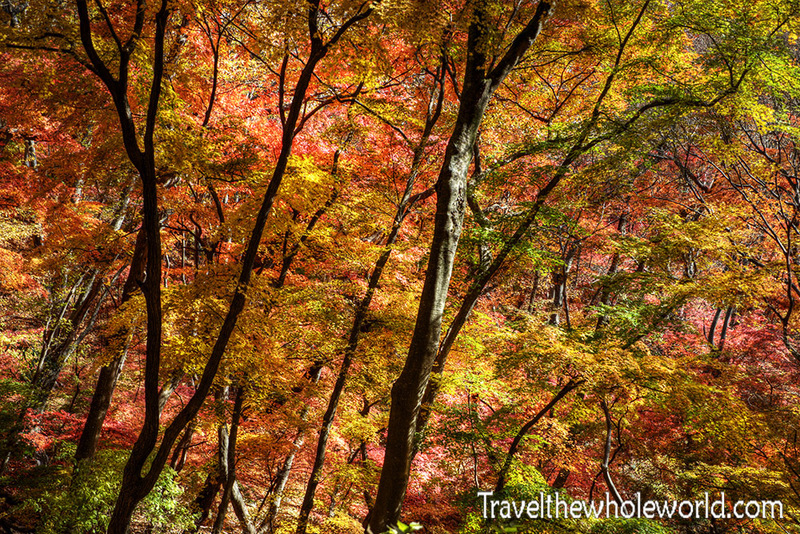 I arrived in mid November, and supposedly Naejangsan’s is the latest place in the country to see fall colors. The internet claimed that fall colors had peaked the day before my visit, but in reality I think it had peaked nearly a week ago. 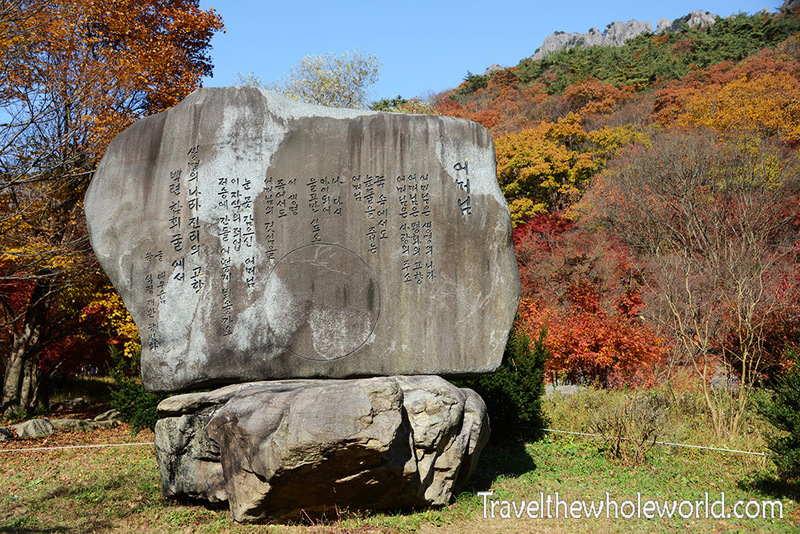 One of the first things I saw when I entered the park was this large stone with an inscription in Korean. 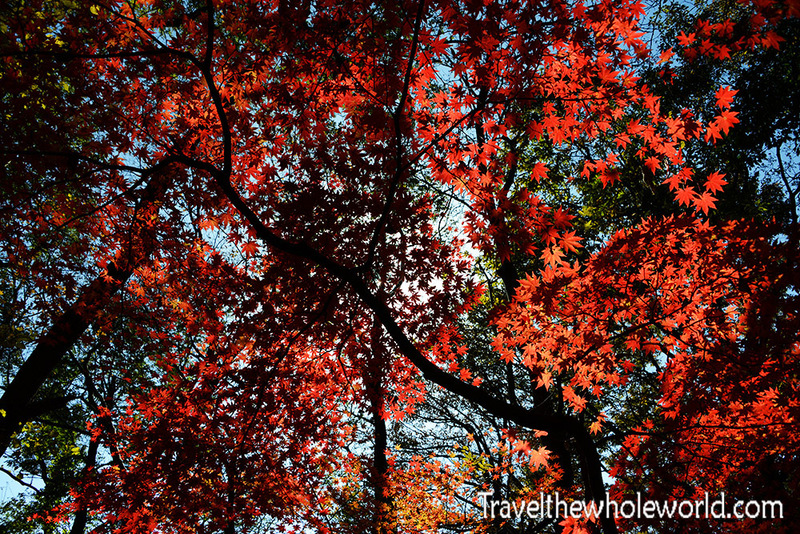 What had really sold me about visiting Naejangsan was some beautiful autumn photos that showed vibrant red maples surrounding a pavilion on a lake. A photographers job is to make things look better than reality, and the photos I had seen had definitely accomplished that. Most of the trees directly by the pavilion had already lost their leaves. The pavilion also looked different than ones I had seen in the photo. A sign nearby described how the original that was built in 1965, “didn’t compliment the lake”, so this new one was built in 2016. 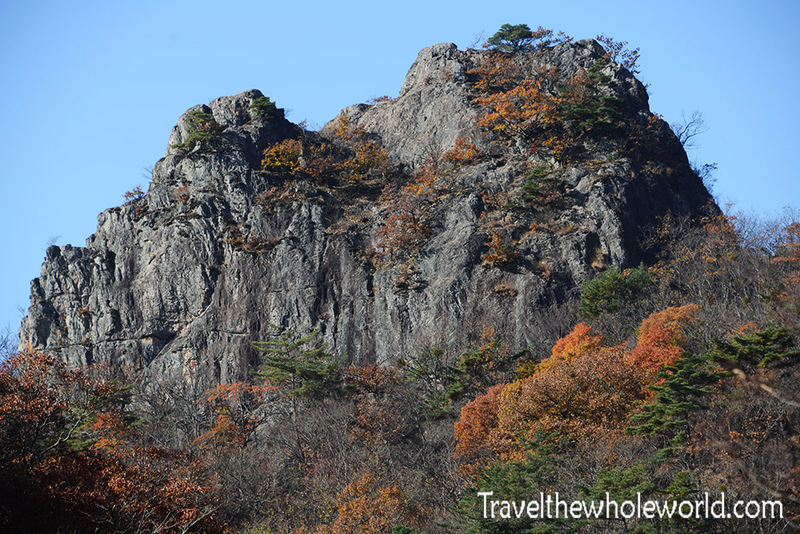 Immediately upon entering the park you can see some of the dramatic mountains in Naejangsan. All of the mountains here have good hiking trail leading to their summits, but this peak looks like it could be an exception. My entire time in the park I couldn’t help but fantasize about having brought my rock climbing gear! 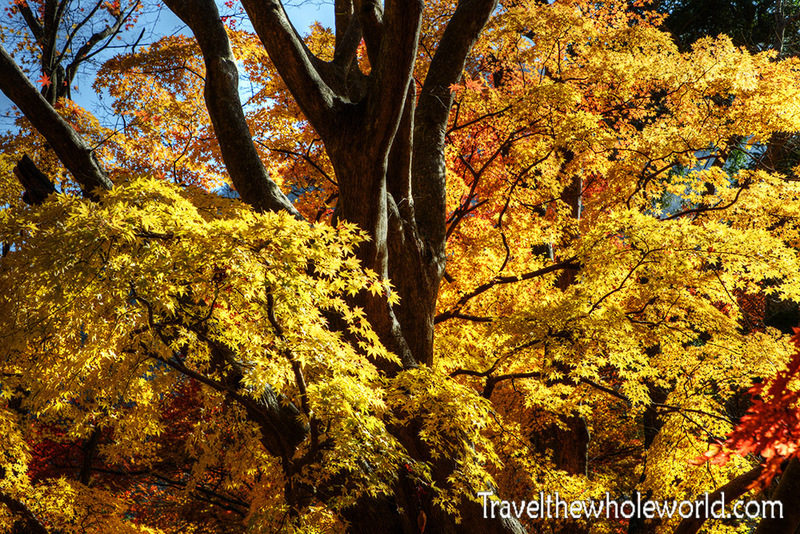 Although fall colors had definitely peaked, they were still several trees that were behind schedule and made it worth the visit. 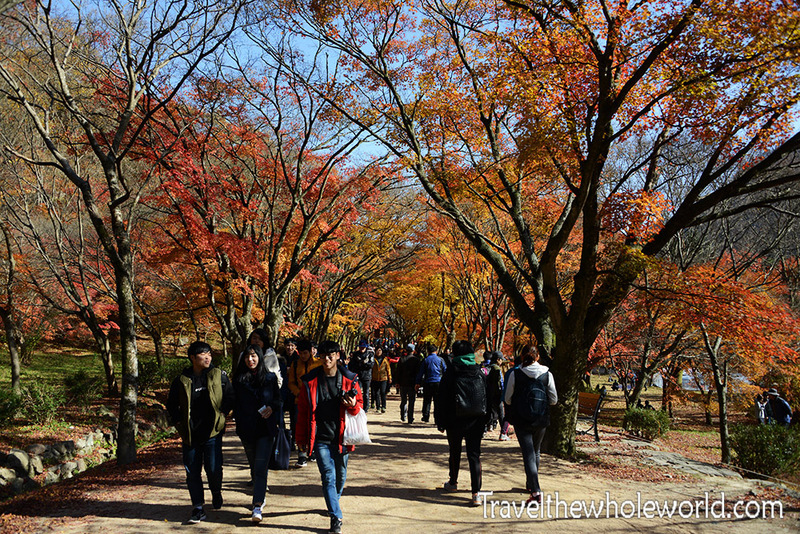 The only draw back with the autumn in Naejangsan was all the people here. I’ve read that as many as a 100,000 people can visit over a weekend. 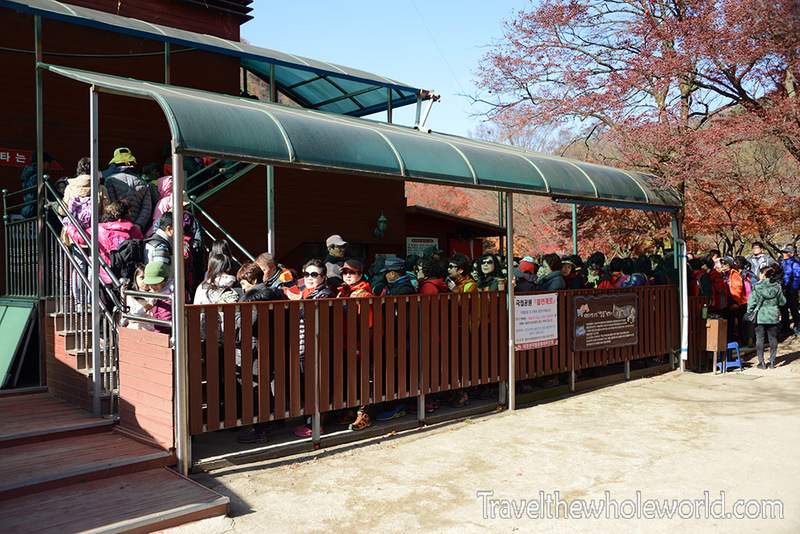 Naejangsan isn’t that large of a park, so you can imagine how crowded the mains trails can be! The majority of the time I was surrounded by a mob of people, and the only reason there was a bit of space around me in these photos was because I had to stand in place and wait. 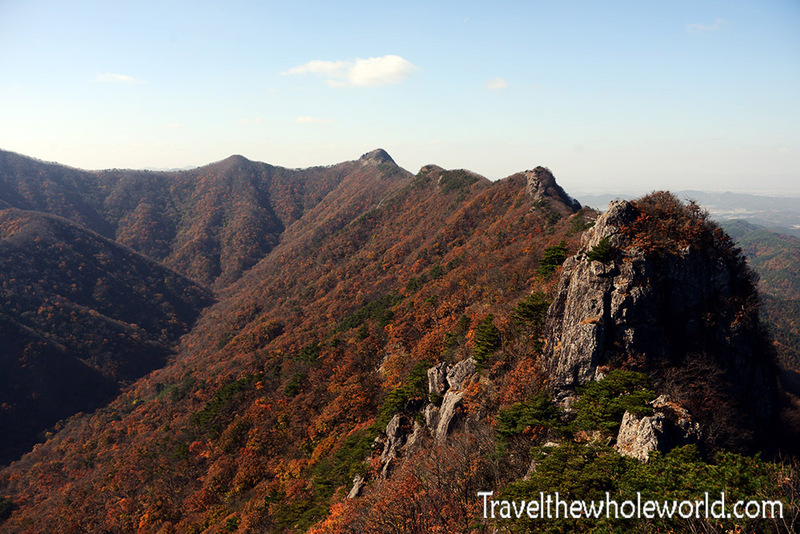 A popular thing to do in Naejangsan is take the cable car up one of the peaks for a 360 view of the park. The sun had been in the right place for this, and maybe I should have gone but the long line was a big turn off for me. I found it difficult to find information on Naejangsan online aside from basic things like entrance fees and how to get here. It turns out there are tons of places to eat, a museum, and even several hotels on site. 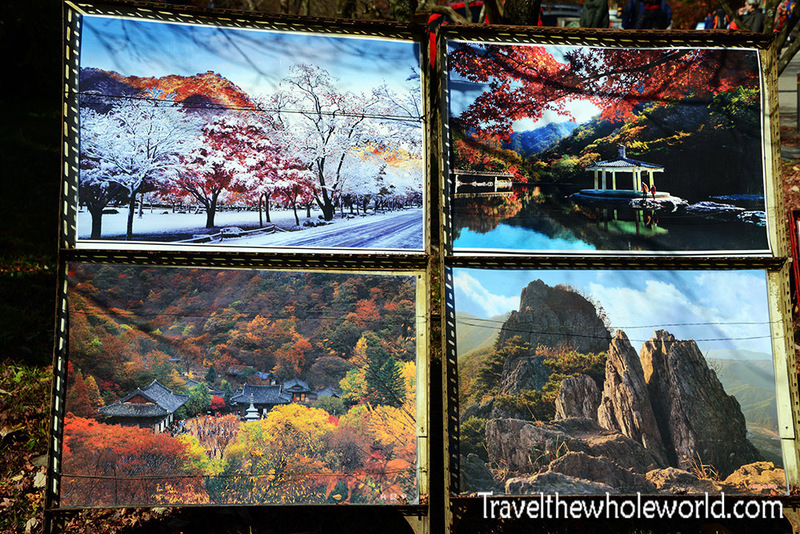 There are also plenty of vendors, such as this one who was selling paintings and photographs of Naejangsan. In one of these you can see what the pavilion looks like in peak fall colors. The museum is small and free of charge, so there is no reason not to visit. The only issue for me was that everything was in Korean, so there wasn’t too much to learn. I’m not sure what this photograph I took above is for since I couldn’t understand the description. 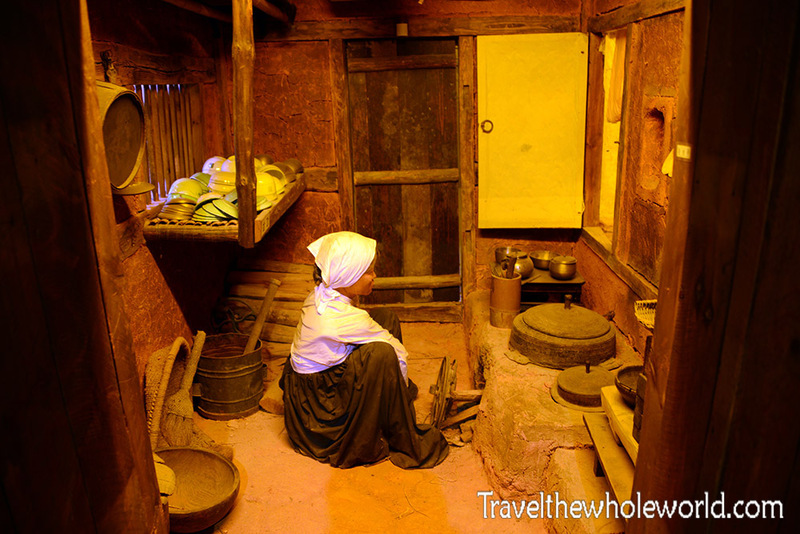 My assumption is that is how locals lived here in the mountains until modern times. What I got most from the museum was seeing the stuffed animals so I could learn what kind of wildlife was in the surroudning mountains.For some reason I didn’t see a single animal during my visit, not even a bird! I suppose all the people scared the wildlife away this weekend. 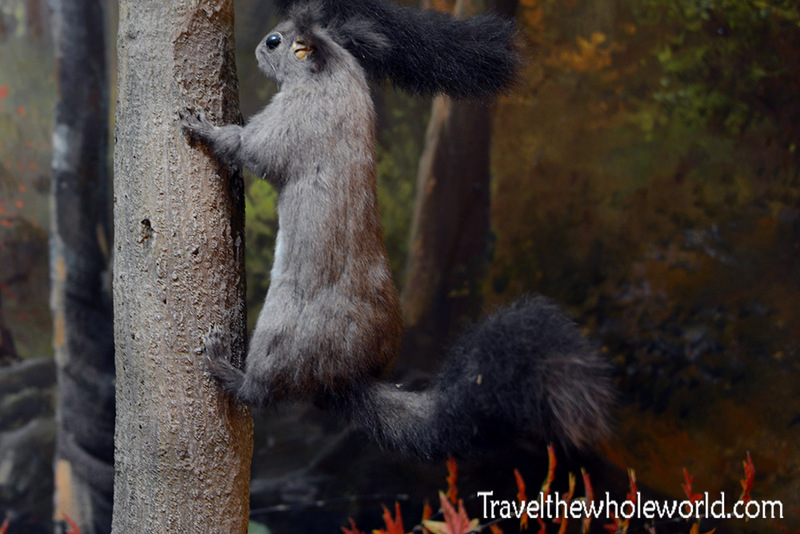 The photo above shows one a species of squirrel that lives in Naejangsan. Another part of the museum had some items in a glass case that were labeled in Korean and English. Most were properly named, such as animal traps and other items used in the forest. In the photo below, the museum had a “Nothing Which Will Come” on display! The most popular activity here is hiking. 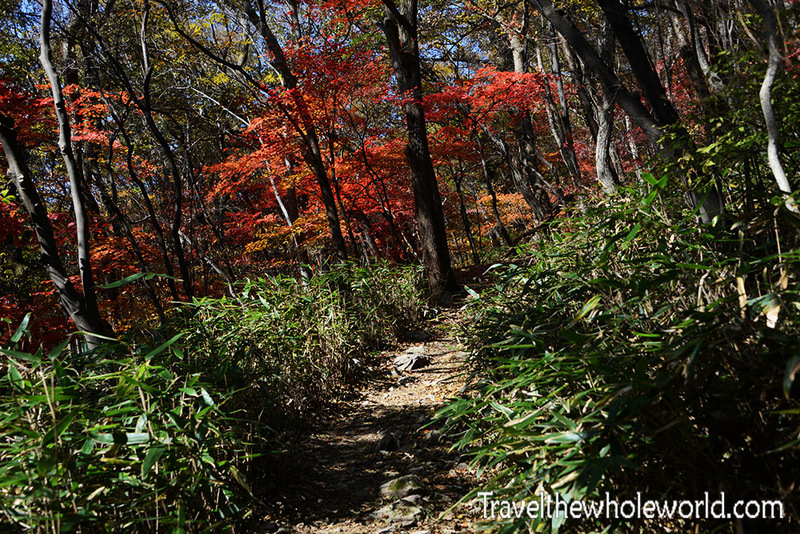 Naejangsan has several well marked trails that you can’t get lost on. The main crowded trails near the entrance of the park passed by what looked to be some type of graveyard. I didn’t see a single other foreigner here, and the majority of the Koreans hiking by seemed to pay no attention to this place. After a family went up to the wall I joined them and took this photo. The main entrance of the park is about a mile and a half (2.5 kilometers) from the heart of the park. 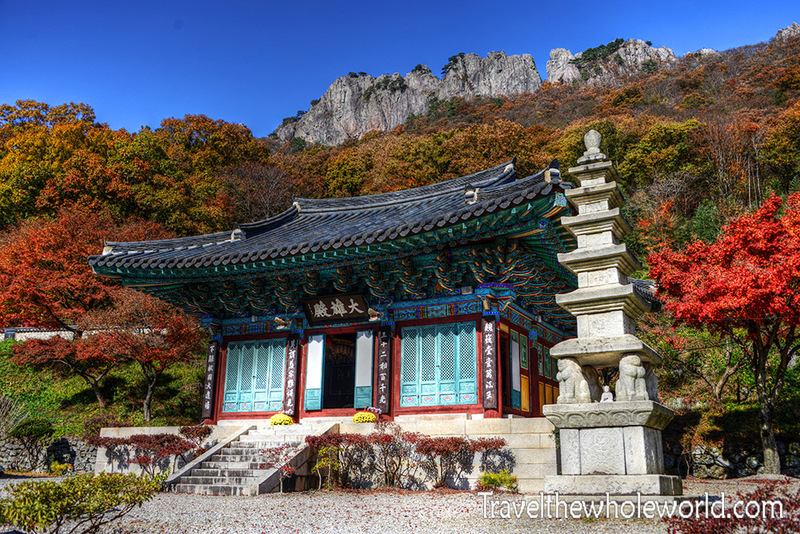 It’s at this location you can find out where the park name comes from; the Naejangsan temple. 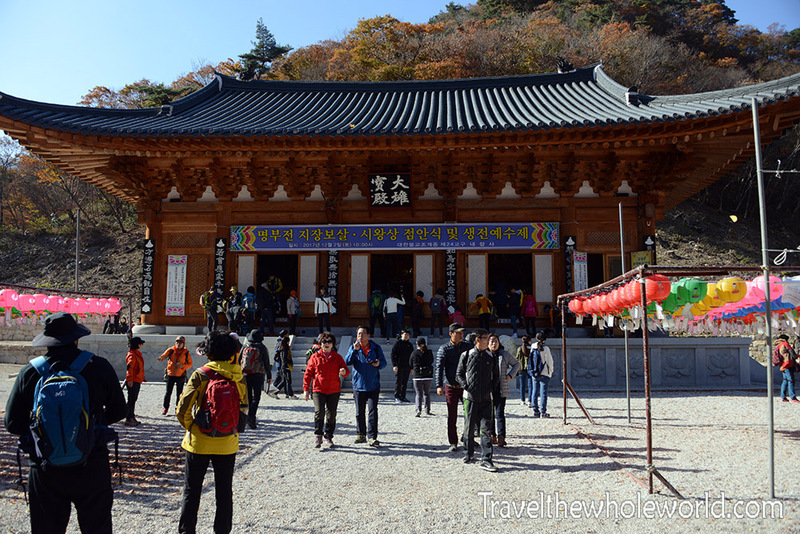 The temple was originally built in 636 CE by the Baekje Dynasty and had around 50 buildings. 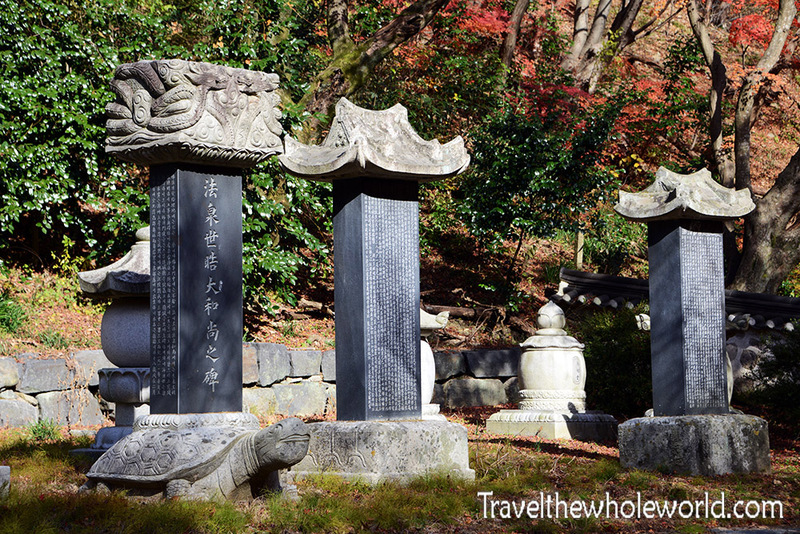 These were all destroyed by Japanese invasions in the 1500’s and the area was attacked again during the Korean War. Today about a dozen have been reconstructed. 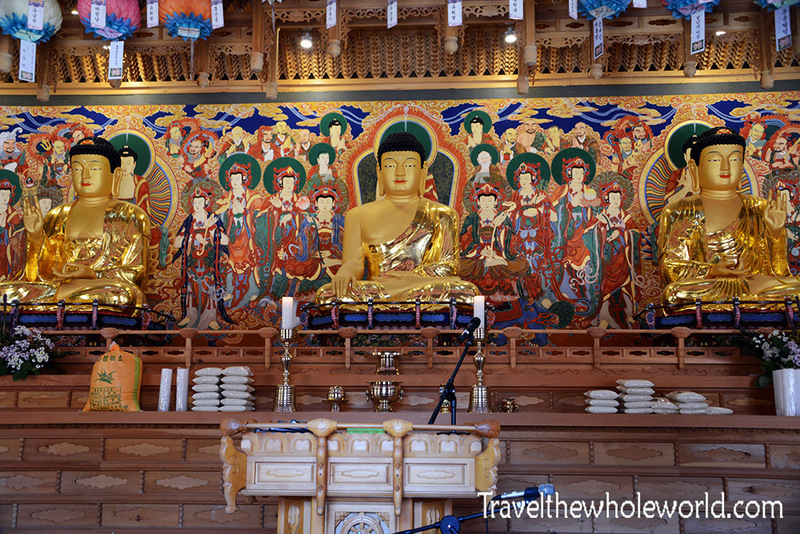 The photo above shows the main temple, and the Buddhas inside below. 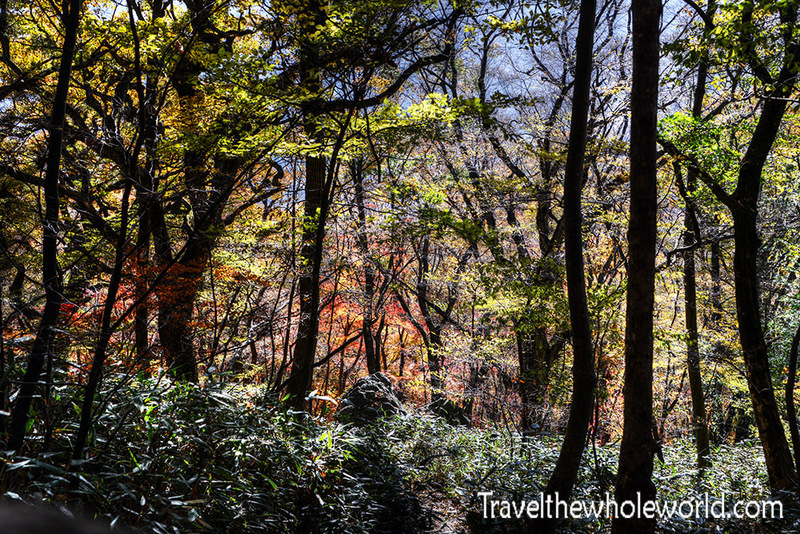 From the Naejangsan temple, there are multiple trails you can take in all directions. At the suggestion of a ranger, I focused my time in the northern ends of the park where the best fall colors were said to be. 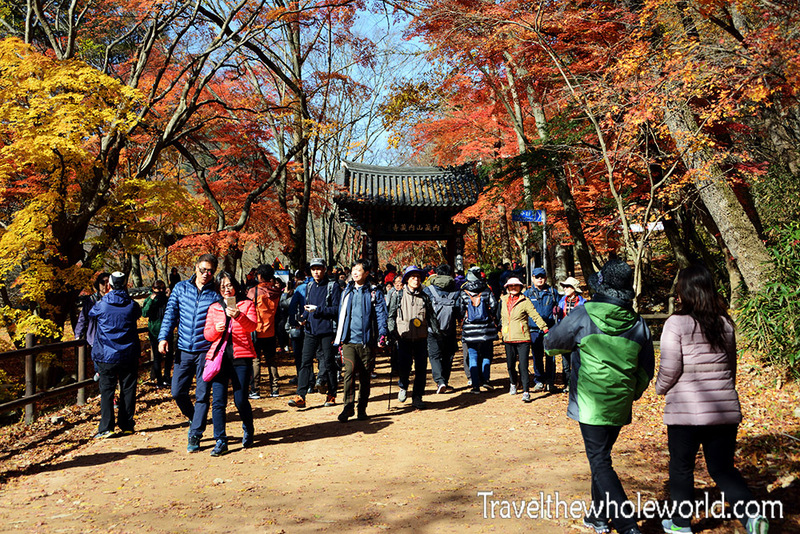 A short hike west from Naejangsan temple takes you to Wonjeokam temple. The temple itself I didn’t find too impressive, but the large Buddha was worth photographing. When I started to hike north, I came across some steep terrain. The hike wasn’t hard, but hard enough that it discouraged the crowds. For the most part I hiked upwards by myself, and every once in a while a large group would come down past me. This photo shows the trail as I began ascending. The ranger had definitely given me good advice regarding where to find the fall colors. During most of the hike the colors had passed or were at best faded. Now and then though I’d enter some colorful areas such as this red canopy above, and this colorful grove below. These last two shots I believe are maple leaves. 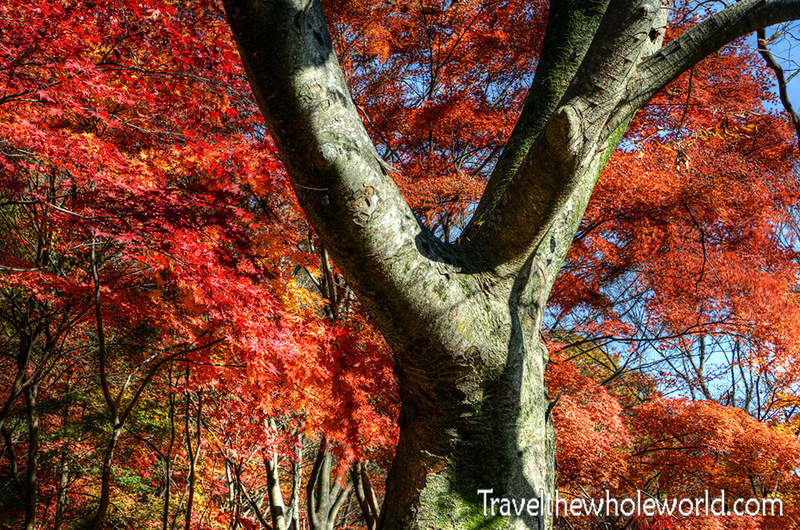 I know for sure that maples are known for their fiery red colors, but can also be yellow as well. 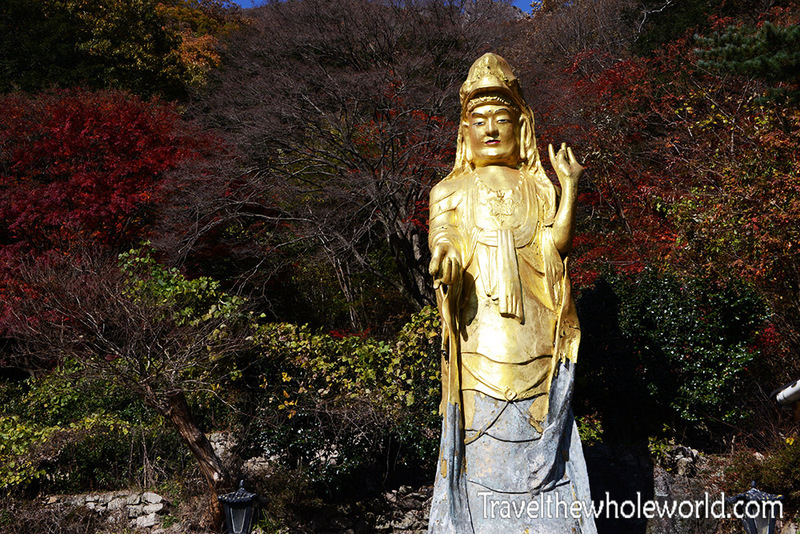 After a moderate hike from Naejangsan temple, I came across my favorite temple in the park. I wish I had more information on it, but all I know is this temple is called Byeokyeonam. 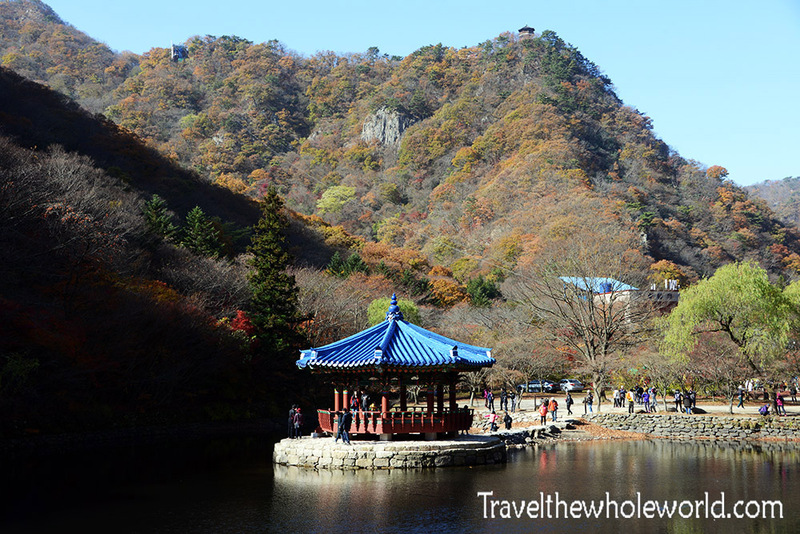 In my opinion it was the most beautiful temple in Naejangsan, and even better you get some great views of the mountains in the area. Directly behind the temple is Seoraebong peak. 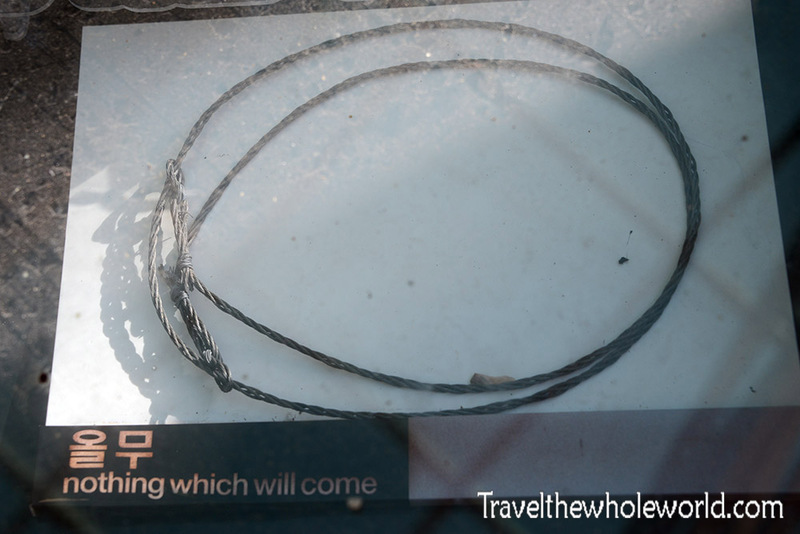 From Byeokyeonam temple, I decided to follow the signs to Seoraebong peak. It was only just over half a mile (1 kilometer) to the summit. Even though the trail was short, it was extremely steep and had enough altitude gain that I could see the terrain changing. From here I still had some colorful trees. 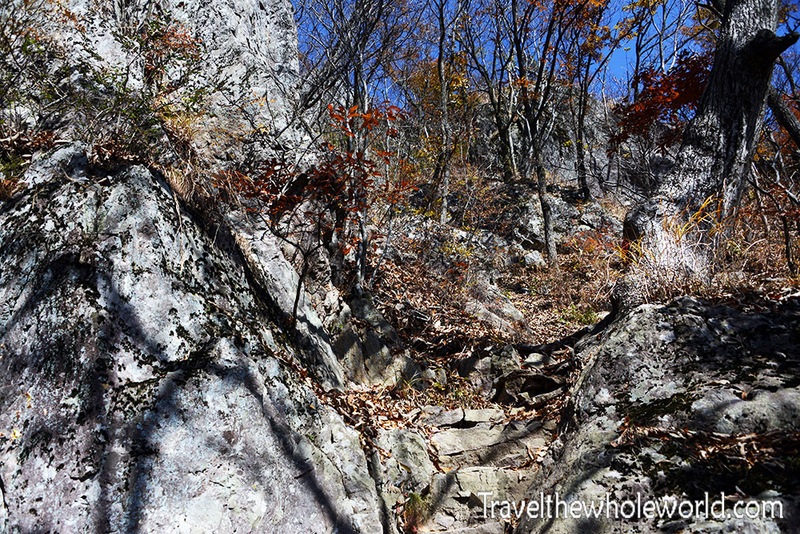 After following a steep forest trail, the terrain got hard enough that the trail turned into switchbacks. The leaves began to thin out, until the trees were mostly bare. 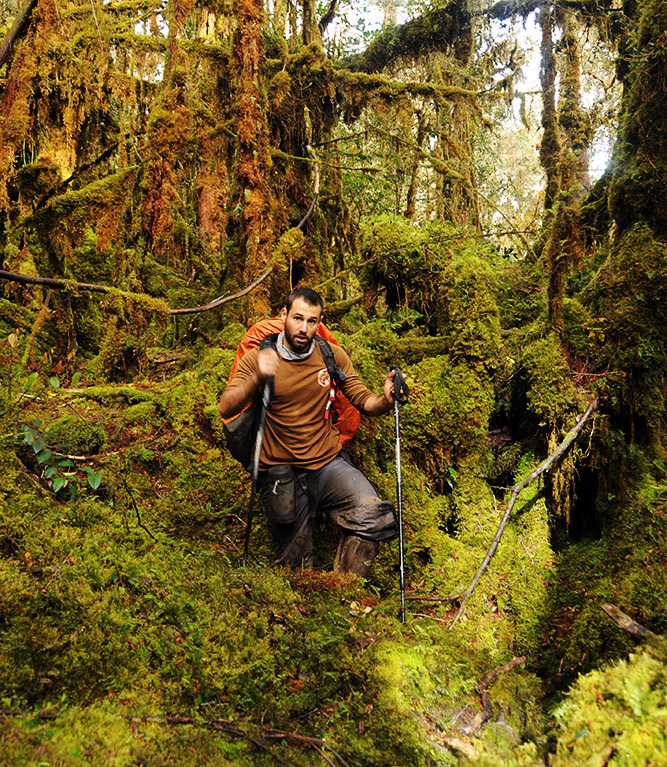 Eventually I came out of the forest and entered some very rocky terrain. Parts that likely would have been a scramble where replaced with stairs. I think that this hike was as hard as it could be when you consider its distance and the low altitude of these mountains. It ended up being a good work out, and I felt a bit ashamed of myself for feeling challenged by a 2,000 foot (648 meter) peak! The views from Seoraebong were great and you could see the entire valley below. On the opposite side of the valley I could see Sinseonbong, the highest mountain in the park, at 2,502 feet (763 meters). There is actually a trail that continues along the entire ridge in the photo below. You can see the ridge going north then west in the photo until it heads south again. 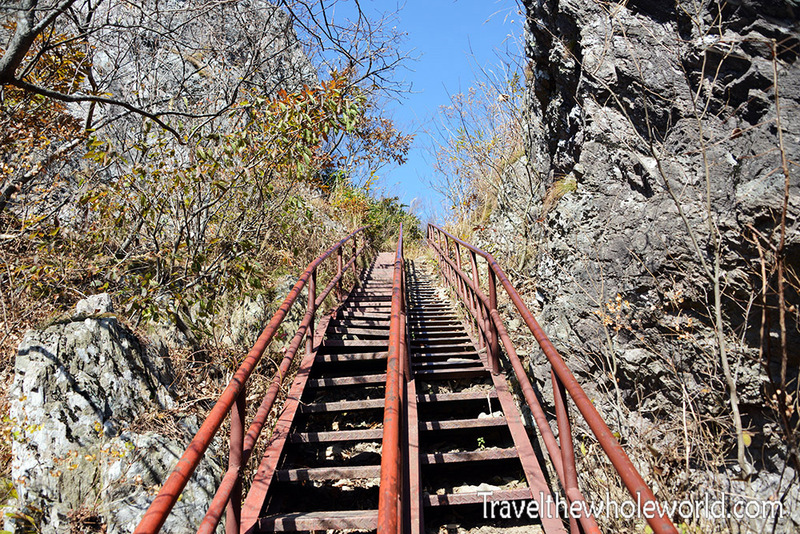 Naejangsan is a small national park, but if you hiked the entire length of this trail you’d definitely need a day or two, and would cover a total of eight peaks!